Description: Color postcard shows workers preparing a Connecticut River Valley tobacco field for the new planting season. 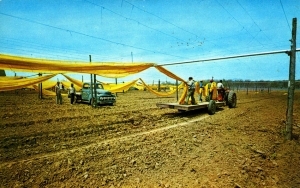 Men pull the yellow shade netting over supporting wires and irrigation piping. The cloth helps create the humid climate preferred for growing shade grown tobacco.